ANTRIM bid to pick up their first points of the National Football League when they host Sligo this Sunday in Corrigan Park. The Saffrons suffered back-to-back defeats in the opening two rounds away to Tipperary and Offaly and are the only side in Division Three without a point. Promoted from Division Four last season, Antrim weren’t expected to get close to Tipperary in their round one game but last year’s All-Ireland semi-finalists needed two late goals to defeat the Saffrons. However, Frank Fitzsimons and Gearoid Adams witnessed their side lose by 13 points a week later in Tullamore. 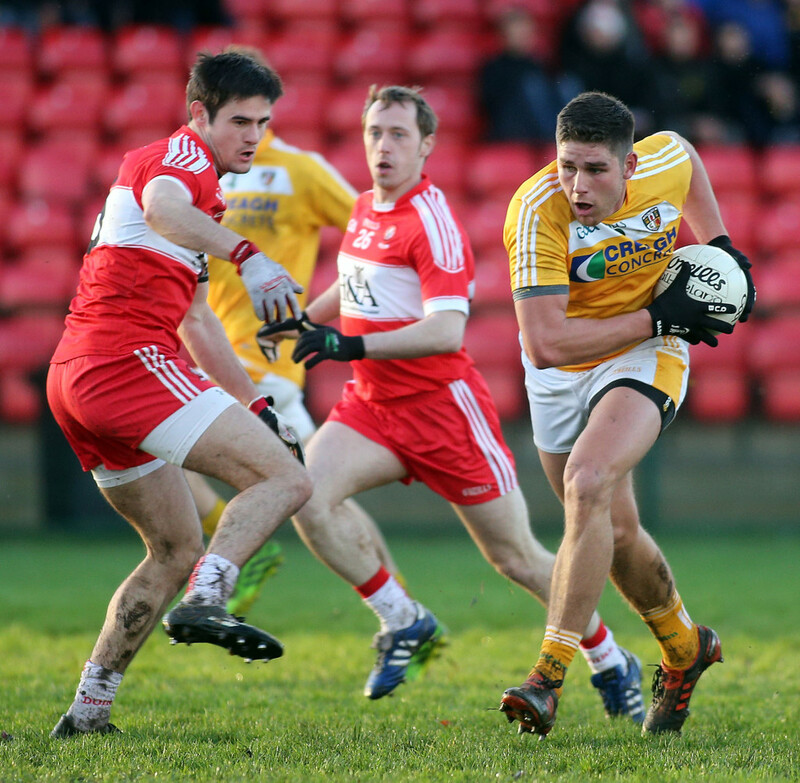 With the Sigerson Cup taking centre stage last weekend, Antrim had a chance to regroup ahead of the round three game against Sligo on Sunday and midfielder Jack Dowling says the mood in the camp is a determined one. “It obviously wasn’t great against Offaly,” said Dowling. “We went back to training last Tuesday and it was one of the best training sessions we have had all year. “We have had a good week of training and we should be in a good position for Sunday. “We have to learn from it. We went back and looked over the Offaly game. You can’t just forget about it. We have to look at where it went wrong. “It was just a bad day at the office. We are determined that nothing like that will happen again. “We played well against Tipperary. I definitely thought we were going to win it until they got the two goals in the last few minutes. They were bombing the ball into the full-forward line. They hit it in 17 times and got two goals. Having travelled to Thurles and Tullamore for their first two games, Antrim will have home advantage when the Yeatsmen travel to Corrigan Park on Sunday. Niall Carew’s side are unbeaten after claiming a dramatic draw against Armagh in their opening game before securing a surprise win over Tipperary in their last outing. Indeed, the Orchard County only have a point to their credit after also losing to Laois and Dowling believes there will be many twists and turns before the conclusion of the league. “We have to try and get two points on our home pitch on Sunday,” said Dowling. “It is a massive game for Sligo as well. They beat Tipperary, I was surprised by that win but they are a good side. They will be coming up the road expecting two points but we’ll not be giving them up too easily. The make-up of the Antrim panel has changed dramatically over the last 12 months with the likes of Brian ‘Bam’ Neeson, Michael McCann and Conor Burke no longer part of the set-up. In their promotion charge last spring, Antrim preferred midfield pairing was Niall McKeever and John Carron with McCann often deployed as a third midfielder. With McKeever, once again, sidelined and Carron opting off the panel, an opportunity has arisen for Dowling to stake his claim at midfield and it is a chance the St Brigid’s clubman is looking to grab with both hands. “I have been knocking about for a few years so hopefully,” added Dowling. “Niall McKeever is set for an operation so he is out and John (Carron) is concentrating on club football. “I have an opportunity to put in a few decent performances and hopefully nail down a starting slot for the rest of the year. There is still a lot of competition there. Kevin Niblock made a welcome return from injury against Offaly and is expected to feature again on Sunday while Tomas McCann is also available for selection after missing the trip to Tullamore. Conor Small picked up an ankle injury against the Faithful County and is doubtful for this weekend. Sean McVeigh also remains a few weeks away from full fitness after suffering a serious groin injury last year. Antrim lost out to Sligo in back-to-back National League Finals in 2009 and 2010 as the counties gained promotion from Division Four and Division Three. After their respective starts to the 2017 league campaign, Sligo will be targeting a return to Division Two while Antrim will be desperate to avoid a swift return to the bottom tier. Those respective aims could will hinge on the 70-plus minutes of football in Corrigan Park on Sunday. Sligo are the form team. Antrim, in contrast, have lost their five competitive matches of 2017. Yet, Antrim were unbeaten at home in the league last year and they realistically need to pick up at least a point this weekend in order to kick-start their league campaign.